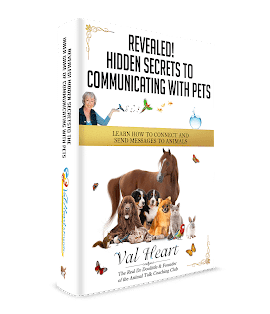 Val Heart, animal communicator, helps when deciding on euthenasia and death and dying. I asked Einstein what he thought he wanted his legacy to be. Einstein: I want to be remembered as The Dog Who Changed the World. I want my legacy to be a world full of humans that I have been able to touch, inspire, educate and teach so that they know, beyond a doubt, that dogs (and all animals) are in fact Divine messengers. That all animals and other beings are sentient, wise, and are fellow travelers here; and I believe this will help humans enjoy a kinder, gentler, more compassionate, more joyful, stable place of being as the world evolves into it’s next State of Being.